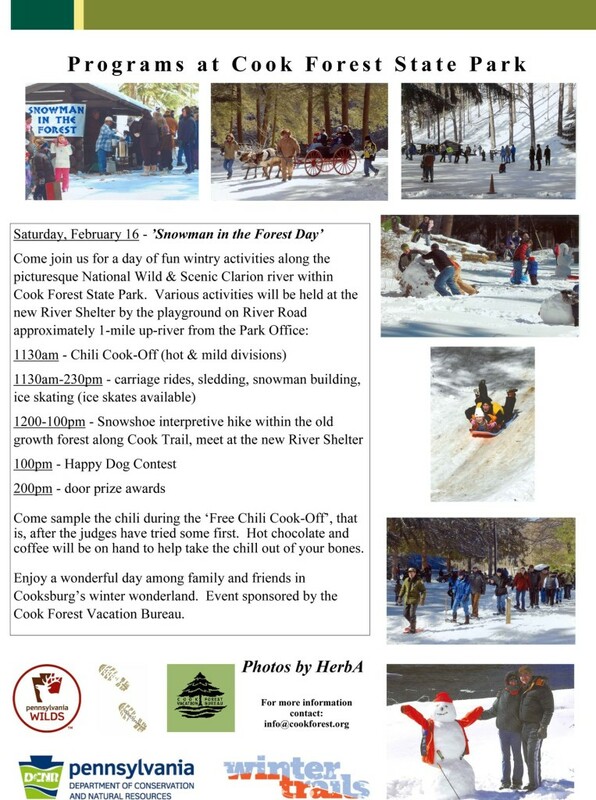 COOKSBURG, Pa. (EYT) – The Cook Forest Vacation Bureau is hosting Snowman in the Forest Day on Saturday, February 16. The event will run from 11:30 a.m. to 2:30 p.m. Various activities will be held at the new River Shelter by the playground on River Road located approximately one mile up the river from the park office. The day will be filled with family fun in Cook Forest. There will be sleigh rides, sledding, skating, snowman building, a Chinese auction, a “Happy Dog” contest, a chili cook-off, hot dogs, and cookies, and much more. Join the Cook Forest Vacation Bureau for a day of fun, wintry activities along the Clarion River within the Cook Forest State Park.